Editor's Comments: This article has been our go-to reference at The Beverage People for understanding and making additions of SO2 in wine. It will help you understand how to use campden tablets or other sources of Free SO2, and know how much potassium metabisulfite per gallon of wine is needed. Additionally, a survey of available SO2 test options and their efficacy is presented. When you add sulfite to wine, sulfur dioxide ionizes to the sulfite ion, SO3—, and bisulfite ion, HSO3—. A small fraction remains in the “molecular” form, SO2. It is this molecular form that protects the wine from spoilage organisms and oxi­dation. As sulfite reacts with other wine components, it becomes “bound” to them and is no longer available to participate in producing “molecular” sulfite. We cannot measure molecular sul­fite directly. Rather, we measure “free” sulfite, and use a table of wine pH values to predict the amount of ‘molecular’ sulfite we will achieve. This is why it is so important to frequently measure your free sulfite. No matter how high your total sulfite (within reason), it is only the free sulfite number that really counts. Don’t just guess and toss some sulfite in. Analyze it first, then add it. To this end, we offer some advice on ways to keep up with testing your SO2. This is the original primary laboratory method for sulfite measurement in wine that helps define what “free” SO2 means. In the AO method, a wine sample is placed in a flask and phosphoric acid is added to force the sulfite ion into molecular SO2. A small air pump pushes air bubbles through the sample. Since sulfur dioxide is a gas, it dissolves in the air stream and transfers to a trapping solution. In the trapping solution, hydrogen peroxide oxidizes the sulfur dioxide into sulfuric acid. Also in the trapping solution is an acid-base indicator that changes color as the sample gas accumulates. After the 10 or 15 minute transfer period, the trapping solution is titrated with sodium hydroxide solution to measure the acid formed. 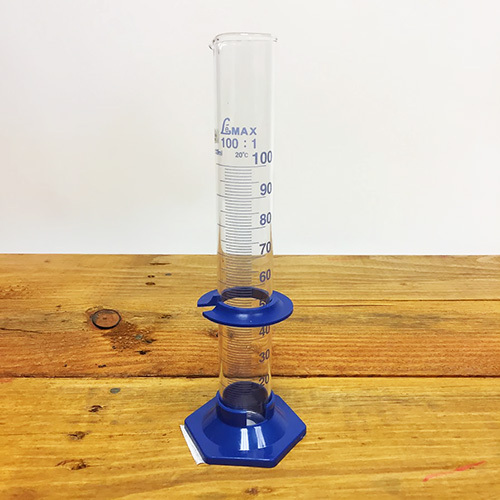 The free sulfite level can be calculated from the titration results. 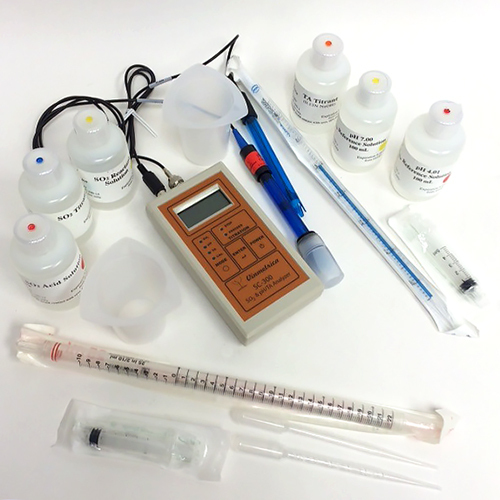 The Beverage People supplies reagents to hobbyists who have Aeration-Oxidation test apparatus. Please note that while we can sell you a 250 ml bottle of 25% phosphoric acid for use in your home apparatus, we cannot ship it. If you are outside the area, look into sourcing this reagent locally. We sell the 10 pack box of Titrets, based on the Ripper method, but they are only recommended for white wine. 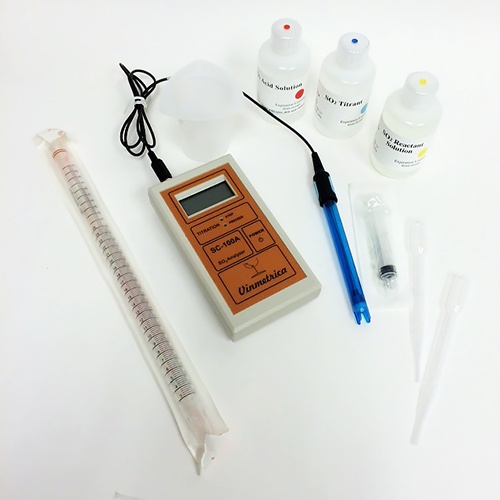 The Ripper method is an iodine titration that is often faster, easier, and cheaper than A/O. It is limited by the chemistry involved. Any substance that reacts with iodine—including some tannins—will be measured as sulfite. Further, the acidification of the sample for the titration tends to release some sulfite bound to anthocyanins (color compounds) in red wine, making it appear “free” when it is not. These Ripper limitations have been largely overcome through a combination of equipment and techniques from Vinmetrica. That company produces proprietary instruments for sulfite analysis (SC-100A) and for sulfite plus titratable acidity (SC-300) that rely on amperometric titration with iodine instead of a visual endpoint or a straight oxidation-reduction (redox) detection. 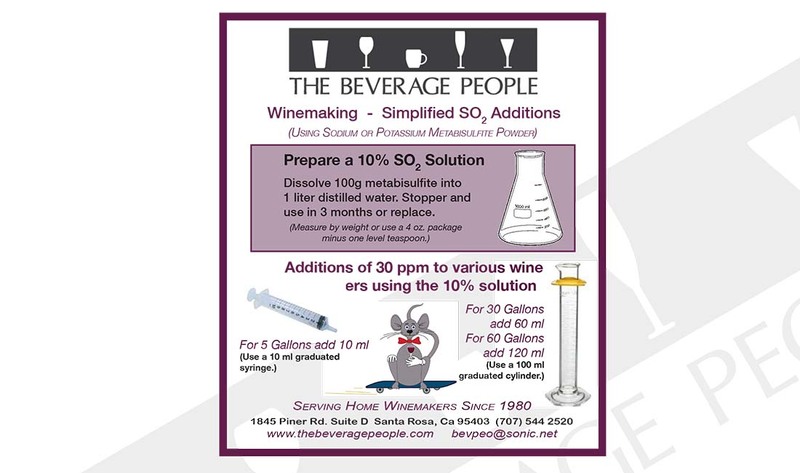 Allowing very rapid titration to overcome release of additional sulfites and showing a very sharp endpoint on the meter to improve precision, they have reduced the discrepancy between AO and Vinmetrica Ripper to only 2 to 3 mg/L (ppm) for most wine samples. Those differences are small enough that the convenience and ease of use will make the Vinmetrica meters attractive choices for many users. If you would rather not do sulfite analysis yourself but you want to do a good job keeping up with your levels, a wine testing laboratory can do it for you. Find a commercial lab or perhaps a university lab near you to minimize shipping of samples. For those of you who live in Northern California Wine Country, we can make it very easy for you. Come by the store and pick up a free sample vial (or use your own screw cap container of 60 ml or more) and fill it all the way up with wine. You don’t want to lose sulfur dioxide gas into the headspace of a partially-filled container. Bring your vial back full and pay for the free SO2 test here at the store. 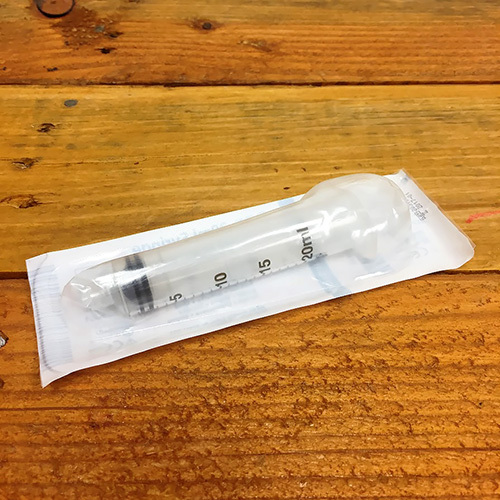 Our lab services partner, Signature Wine Laboratory of Santa Rosa, will pick up the sample and will test it using approved techniques. We also partner with Gusmer Enterprises, Inc. of Windsor, which offers two testing panels for home winemakers on their FOSS WineScan, If you authorize them to (which we recommend) they will email us a copy of your report when they email it to you as well. Give us a call if you would like to discuss your results! Initial sulfite may be added at 50-65 ppm to grapes or juice that is free of rot or mold. The presence of a lot of mold, or grapes in otherwise bad condition, might require twice that amount. Under average conditions the information that follows should keep about 20 to 30 ppm of free SO2 available throughout the wine’s cycle of production through bottling. If you plan to use ML bacteria, pre-ML sulfite additions should be kept below 50 ppm. After ML fermentation is complete add 30 ppm, and five days later add 30 ppm again, and AGAIN one week later. Now get the wine tested for free SO2. The test results may surprise you, as the SO2 you have added my have been dissipating at a rapid rate initially. Above pH 3.5, you will notice that the amounts of free sulfur dioxide required become quite high. It is best to lower the pH by adding tartaric acid early in the fermentation cycle. Continue testing every 6-8 weeks, adding SO2 as required to keep at least 20-30 ppm. available in the wine. SO2 is available as Campden tablets, effervescent Inodose metabisulfite tablets and as powdered potassium metabisulfite. A premeasured Camp­den tablet equals 65 ppm in one gallon (13 ppm in a five gallon jug) and is very convenient for those making small amounts of wine. Crush the tablet to a powder to add it. The 2 gram Inodose tablets add 528 ppm per gallon or 9 ppm per 60 gallons. The 5 gram Inodose tablets add 1320 ppm per gallon or 22 ppm per 60 gallons. The tablets can by dissolved in water to accurately dose carboys. Metabisul­fite powder is added in a liquid preparation to adequately disperse it, and because it is very potent. This is also the least expensive method and accurate to measure for any size container. It is generally recognized that only a small amount of molecular SO2 (.5 to .8 ppm.) needs to be present to provide bacterial stability in wine, but pH has an important effect on how much free SO2 is needed in order to provide that amount, and this is why both pH and SO2 need to be tested. Regard the Table of Molecular SO2 below. The amount of free SO2 needed is based on the pH of the wine. A fairly safe amount for protection of the wine is either .5 ppm for red wines or .8 ppm for white wines. If you know the pH, simply make sure you have the corresponding level of free SO2, or slightly more, present in the wine during storage and bottling. 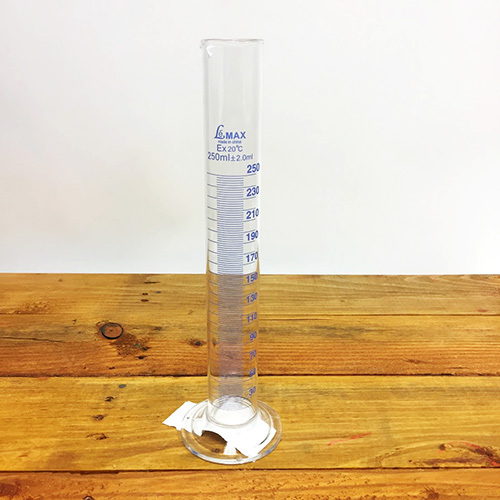 Using a gram scale, weigh out 100 grams of potassium metabi­sulfite and dissolve in 1 Liter of water. Tightly stopper and store labeled: poison. When adding your sulfite additions make sure you measure carefully. Replace your solution every 3 months. Dissolve four ounces of potassium metabisulfite powder, in one gallon of distilled water. This is a weaker solution than the 10% solution given above. However, at this concentration, the solution is still quite strong and should be labeled: poison. If you ever need to lower your SO2 due to a mistake in calculation try splash racking or stirring vigorously to aerate. If the free SO2 is still too high do the following: for every 10 ppm free SO2 you want to remove, add 1 ml. of 3% hydrogen peroxide per gallon of wine. An oxidative reaction occurs immediately. Use only fresh 3% Hydrogen Peroxide, available at the drugstore. Use this method to remove up to 100 ppm - any more than this and the wine will oxidize and lose its flavor.